In 1779, George Washington chose the color blue for the first US Army. Blue was a fabric dye readily available at the time and was easy to distinguish on the battlefield from the British red. 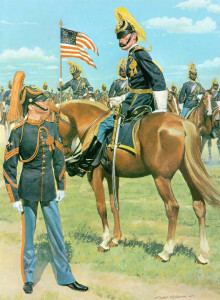 Variations of blue uniforms served as both service and dress uniforms until 1898 when khaki and olive drab colors were introduced and blue was relegated to dress occasions. After 1917 is was worn only by Officers and Senior Enlisted Service Members. By the end of WWII “dress blues” (and tropic-weight whites) were exclusive to very formal occasions while “Army Greens” the “Class A” uniform became the army equivalent of a civilian business suit. In 2008 the Army announced that the various dress service uniforms would be streamlined into one blue dress uniform known as the Army Service Uniform and by 2015 “greens” were gone and the Army was once again “blue”. 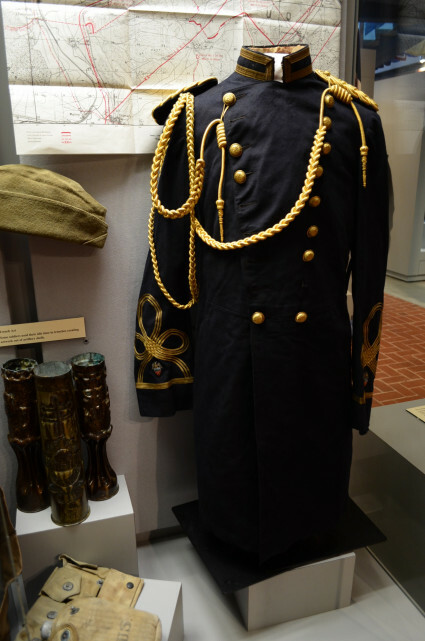 This 1902 Regulation dress uniform is one of the last of its kind from the Army’s first period of “blue”. It display’s the rank of a US Army Major in the three lines of gold braid on his sleeves and shoulder knots. The buttons are Louisiana State “Pelicans” manufactured by the Scoville Company of Waterbury, Connecticut. This officer probably served on the staff of the Louisiana Adjutant General as shown by the insignia found near the bottom of each sleeve – a gold bullion eagle above the red, white and blue finely embroidered federal shield. The two stars in the shield indicate that he serves as Aide to a Major General. 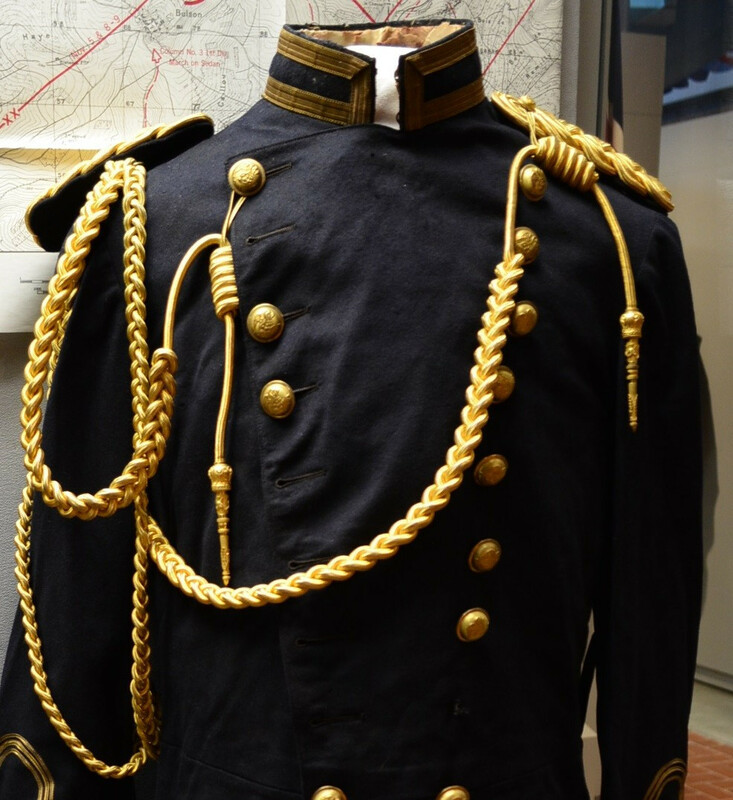 Attached to the right shoulder knot are double woven gold braid cords and the single cord with gold mace drop of the Adjutant General’s staff. See other Featured Artifacts here.